If you know me at all, you know that I am not a review blogger. I don't often do giveaways either. However, if you wave something cool in front of my face for free, and also tell me that I can break something off for my readers, well then I start humming "it ain't no fun, if the homies can't haaaaave none..."
Are you allowed to sample Snoop Dogg in an FTC disclaimer? Guess I'll find out soon enough. It's a Bird, It's a Plane, It's Tony Hawk Crashing Into a Fountain! Last year, Tony Hawk revolutionized virtual skateboarding with Ride. Featuring a controller that was pretty much a skateboard deck with wicked advanced technology inside, the game allowed you to control your character by literally riding the skateboard controller. This year's follow up to that game is called Shred. And it rocks. Whereas Ride strove for ultra realism in its venues and tricks, Shred is more like how you would ride a skateboard while lucid dreaming. You launch yourself off buildings, perform 4 kick flips while sailing from one rooftop to another, and crash in spectacular immortal fashion into landmarks and fountains and stuff. Kind of like if they skateboarded in the Matrix. Graphics-wise, they went with more of a comic book feel. They also added snowboarding to the mix. What does this ex-skate punk like best about Tony Hawk Shred? I can tear it up with baby on board. What does Fury like about it? Bigger air, less effort. What did the neighborhood kids like about it? They got to be "on the internet" as part of my Tony Hawk Shred review. They all gave this game a big "rock on" as well. So real, you gotta wear a helmet. So, you want to win your own copy of Tony Hawk Shred for Wii? Watch the video at the bottom of this post. You'll receive instructions on how to enter, as well as earn extra entries for individual items featured in this post. Luckily, we're good at making sound effects, so we engaged our RC cars in driveway death matches, complete with all the "pchew! pchew!" action you could ever ask for. This year, things are different, thanks to Battle Machines, by Jada Toys. I wish I invented these, because then I would have the hottest toy of the holiday season under my belt. Combining laser tag with Radio Control, Battle Machines are pretty much my childhood dream, manufactured. It works like this. You each get one truck and one controller. You can control the movement of the truck just like you would a standard RC vehicle. But then each controller also has a trigger. If you maneuver your truck behind your opponent's and fire, your opponent's truck will suffer 1 hit. When you've hit your opponent 3 times (indicated by all 3 hit lights being lit), their car dies. For one player action, you can make the other car go on autopilot, so you can chase it around and shoot it. Seriously, how cool is that? 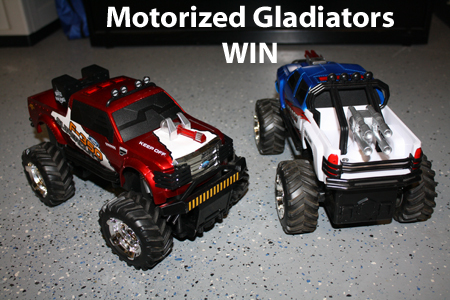 So, you want to win your own Battle Machines 2-pack (2 trucks, 2 controllers)? Watch the video at the bottom of this post. You'll receive instructions on how to enter, as well as earn extra entries for individual items featured in this post. I personally love Fury's rendition of "game console" - it totally captures the essence of a Wii. Also, the knife was genius due to the use of contextual clues. Sorry, no giveaway available for this item. However, you can download the free app version here. 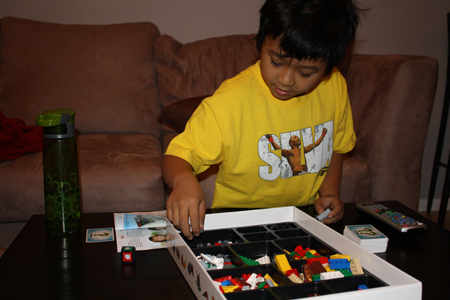 "Hey dad, how come all the games in your day were made up of squares??" That was Fury's first reaction to Atari Greatest Hits. And then it was laughter. Kids. What do they know? Eventually, once he got over the fact that you kind of have to use your imagination when playing a classic 80s video game, he enjoyed this. For a few minutes. Which is fine, because I will play Missile Command, Asteroids, Tempest and Centipede all day long. 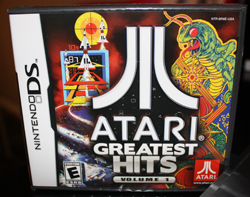 Atari Greatest Hits has everything you thought was cutting edge amazing 25 years ago. I really wish it had Combat, though. That was my all-time favorite. This isn't your everyday beanie. Notice the wires going to his Nintendo DS? That is a Sound Disk Beanie by Aerial7. It has headsets sewn right into them. Man, back in our day, we had to work hard to look cool. And our Walkman headsets didn't help the cause at all. Aerial7, you are spoiling our kids. Let this be my official complaint in writing. So, you want to win a copy of Atari Greatest Hits, Vol. 1 or a pair of Aerial7 headphones? Watch the video at the bottom of this post. You'll receive instructions on how to enter, as well as earn extra entries for individual items featured in this post. I know this is totally random for a holiday gift idea, but hear me out. These two guys decided one day that it would be cool to start a company that sold custom healthy cereal. So they did. And it was. See how he named it "The Furious Mix" and uploaded a picture of himself driving an Aston Martin (see the rest of our photoset from the LA Auto Show here)? The kid's got class I tell ya. The cereal is pretty good too. Just remember that it's healthy, so don't expect it to taste like Capt. Crunch. Also, the shape of the cereal tube makes this an excellent stocking stuffer. See? I knew I could find the relevant tie-in, given enough time. So, you want to win your own custom cereal? Watch the video at the bottom of this post. You'll receive instructions on how to enter, as well as earn extra entries for individual items featured in this post. I will talk about whole grain cereal in one sentence and then switch up on you and talk about a juicy flame broiled Whopper the next. Why? Because there's a time and place for everything, and now seems like a great time. I loves me a Whopper or 3. In fact, I love Whoppers so much, that when my parents used to take us to Burger King when we were kids, I'd challenge my sister (who wasn't a vegetarian yet) to a race to see who could finish their Whopper first. Then I'd eat slow and let her win. Why? Because I hated finishing my Whopper first and watching her enjoy hers while I had none left. True story. I confessed that to her a few years ago and she called me a dork. Anyway, just wanted to remind you that when you're all frazzled from shopping for the holidays and have no desire to put something on the stove, a Whopper will never judge you. And it's flame broiled. Oh, also, Burger King wants to give one lucky Busy Dad Blog reader an Xbox Kinect prize pack. Yup. 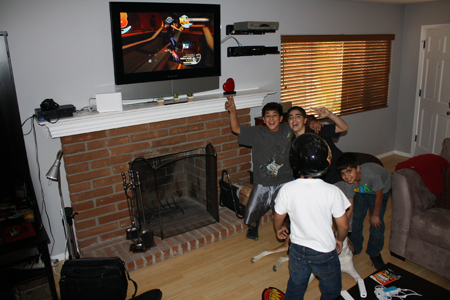 An Xbox Kinect prize pack, complete with an Xbox 360 4GB console, Kinect Sensor, and two games (Kinect ADVENTURES and Kinect SPORTS). Plus a $10 BK gift card. And no, I did not even get one. This is just for you. Because I want you to be happy, and also tell everyone what a nice guy I am. But I reserve the right to come over sometime and try it out. So how do you win this Xbox? Watch the video at the bottom of this post. You'll receive instructions on how to enter, as well as earn extra entries for individual items featured in this post. Before you watch this video, remember. Honor is a very important thing to me. Your first quest is based upon the honor system. You may try to game the quest, but that would make me sad. And you wouldn't like me when I'm sad. You have until Wed, December 15, 9pm PST to enter.